OMAHA, NE—Warren Buffett lost money but had a pretty good quarter. Berkshire Hathaway Inc on Saturday reported an unusual quarterly net loss, the result of an accounting change that Buffett had warned would produce “wild” but in his view meaningless swings in results. But Berkshire also ended a long stretch of disappointing operating performance, posting record operating profit as insurance rebounded from a difficult quarter while economic growth bolstered results in railroad, industrial and consumer businesses. Berkshire posted a first-quarter net loss of $1.14 billion, or $692 per Class A share, compared with net income of $4.06 billion, or $2,469 per share, a year earlier. The accounting change required Berkshire to report $6.2 billion of unrealized losses in its marketable stock portfolio, which totaled $170.5 billion at year end, regardless of whether it planned to sell those stocks. Two of Berkshire’s biggest stock investments, Wells Fargo &amp; Co and Coca-Cola Co , had tough first quarters, falling 13.6 percent and 5.3 percent, respectively. Buffett has called the new accounting rule a “nightmare” that would produce “truly wild and capricious swings” in bottom-line results that could, depending on their direction, unnecessarily scare or embolden investors. 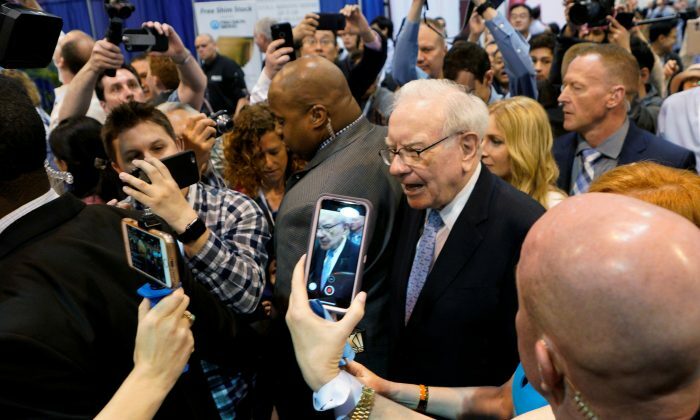 “It really is not representative of what’s going on in the business at all,” Buffett told shareholders at Berkshire’s annual meeting in Omaha, Nebraska. Berkshire said its operating profit, which Buffett considers a better performance measure, rose 49 percent to $5.29 billion, or about $3,215 per Class A share, from $3.56 billion, or $2,163 per share, a year earlier. Analysts, on average, expected operating profit of about $3,116 per Class A share, according to Thomson Reuters I/B/E/S. Operating profit had previously fallen for five straight quarters, and missed Wall Street forecasts for eight straight. Book value, which measures assets minus liabilities, also took a hit from falling stock prices, falling 0.3 percent to $211,184 per Class A share, even though Buffett boosted his stake in Apple Inc by $12.5 billion in the quarter. Some analysts have said the stock losses have weighed on Berkshire shares, which are 10 percent below their record highs set on Jan. 29. In Friday trading, the Class A shares closed at$292,600, and the Class B shares at $195.64. Buffett, 87, and Vice Chairman Vice Chairman Charlie Munger, 94, are answering five hours of questions from shareholders, journalists and analysts at the annual meeting. Despite the Apple purchase, Berkshire ended the quarter with $108.6 billion of cash and equivalents, giving Buffett ammunition to make one or more “huge” non-insurance acquisitions he has said he wants. Berkshire’s insurance businesses, which had been struggled with losses from hurricanes and other events, posted a $407 million underwriting profit, compared with a year earlier $267 million loss. Buffett said the Geico car insurer had “quite a good-sized turnaround in profitability.” Pre-tax underwriting gains nearly quadrupled, as it sold more policies despite having raised rates, while the rate of policyholder losses fell. An improving economy led to higher business volume at the BNSF railroad, which saw profit rise 37 percent to $1.15 billion. Pretax profit at industrial businesses such as Precision Castparts rose 32 percent, while lower taxes helped boost profit at the Berkshire Hathaway Energy unit by 22 percent.